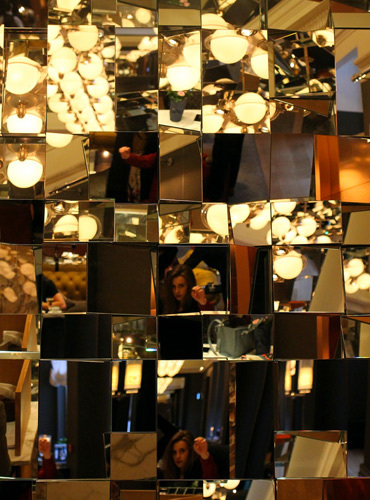 There is certainly no shortage of mirrors on the wall in Rosewood London’s restaurant, The Mirror Room. They form a kaleidoscope of reflected shapes and throughout the evening you’ll catch reflections of yourself in them, in the big Art Deco mirrors in the dining area, in the silver cups on the table. 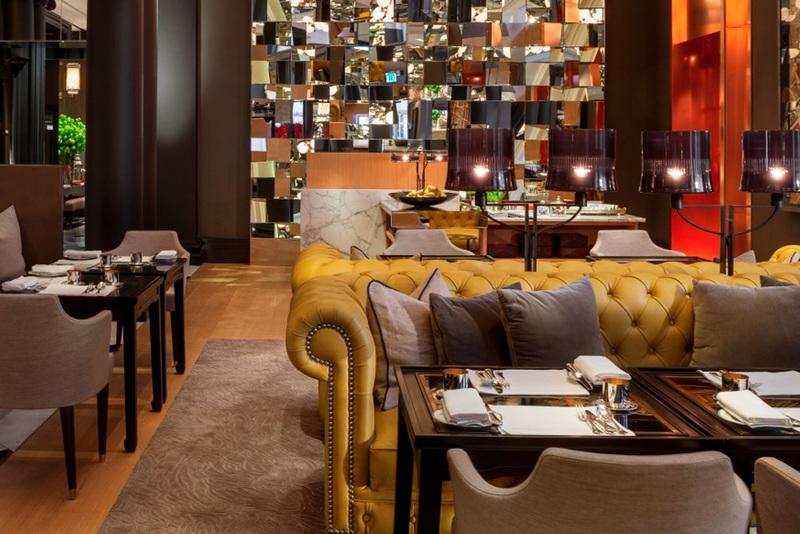 Fortunately, your reflection is smiling, flatteringly lit, surrounded by the luxurious decor and the intense autumnal hues of the furniture. I’ll leave it to you to decide whether or not you’re the fairest of them all. 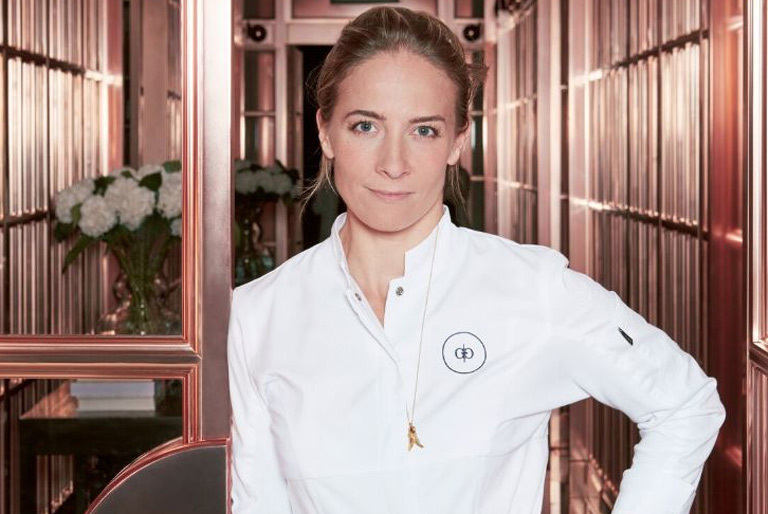 We visited The Mirror Room in late October, tempted by the prospect of a new menu from Executive Chef Amandine Chaignot, whose modern French style was honed while working with the likes of Alain Ducasse, Yannick Alleno and Eric Frechon. The new menu is titled ‘Woodland’, inspired by seasonal British ingredients of the autumn and winter, as well as Chaignot’s own creative playfulness and love of nature. I immediately thought of log fires, crisp evenings and tendrils of mist grasping through bare trees. For me, it’s the perfect time to indulge in fine food and wine. We began with a refreshing Ruinart Rosé while perusing the menu. On my left was a huge display of berry-laden boughs in (reflective) urns, while on my right was a panel of one-way mirrors through which there was the occasional crawling illumination of car headlights from the courtyard. The seating is well spaced; at no point was I even aware of other diners nearby. It must be said that the tables and seats are quite low; it was impossible to fit long legs (or legs with heeled shoes) underneath. However, it was easy to forget this once we had made our selections and maitre d’ Francisco has presented us with a ‘sensory board’ containing ingredients that had inspired the menu. Pine fronds, walnuts, mushrooms and chestnuts were arranged on a tray in their raw form, merely to fire up the senses in preparation for the food. We had a little rummage, took deep whiffs of fragrant meadowsweet and began our woodland journey. 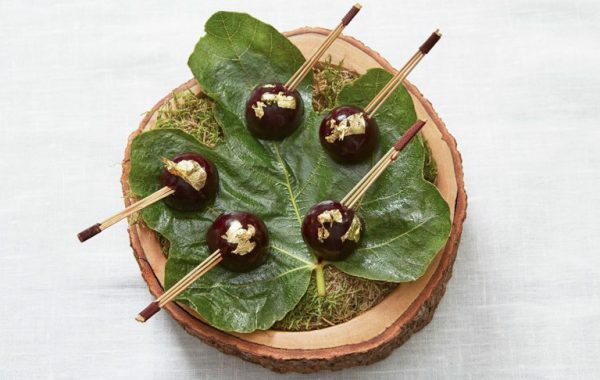 We had selected the foie gras and blackurrant canapés, which arrived in a suitably presented fashion on a bed of woodland mosses. There were five orbs of creamy foie gras on little sticks , like cake pops, covered in blackcurrant glaze and sugary biscuit crumb (yes, chefs, odd numbers do look better, but friendships may crumble fighting over the last one). Unusually, sommelier Michael brought us a sweet wine to accompany this, a 2007 Roccolo Grassi Valpolicella that managed to enhance the saltiness of the foie gras. Our starters were quickly brought by our very sweet waiter, Claudia. 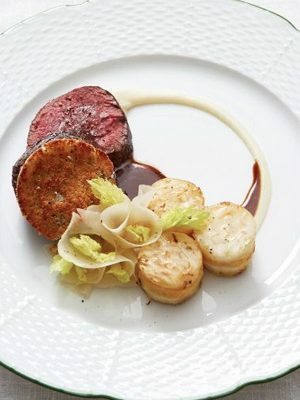 Charlotte’s carpaccio of grouse had been adapted (no girolle purée) to accommodate her mushroom allergy but was savoury, gamey and raw – a carnivore’s dream. Michael, who was quickly showing his expertise, had selected a light textured but bloody Lebanese 1999 Château Musar, with a hint of sweetness that complimented the dish very nicely. 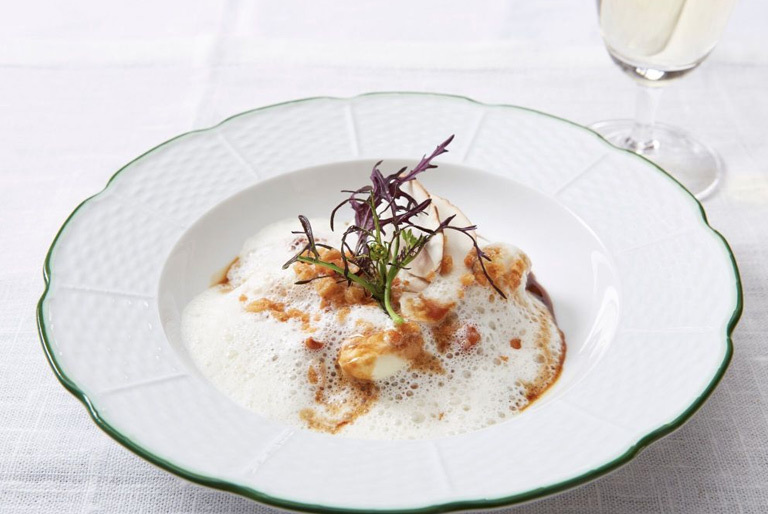 My first course was Chaignot’s signature ‘Wild Mushroom’, a combination of fungi and light-as-a-feather chicken quenelles, which captured the warmth and depth of autumn’s flavours. As a good sommelier should, Michael had given us some very interesting information about my wine, a 2014 Jurançon Sec, which was made by an 80 year old woman who had taken up winemaking after the death of her husband and is now widely recognised as one of the best winemakers in the Domaine de Souch. The clean minerality was a perfect pairing for the mushrooms, brightening the mellow earthiness so each component could be tasted separately. 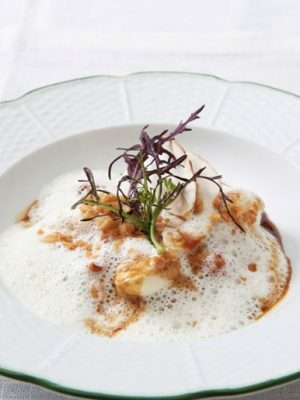 I continued with the mushroom theme, choosing the lobster fricassee with black trumpets and creamy bisque. There was a lot of perfectly cooked lobster flesh and, although I did briefly wonder which woodland is home to this tasty crustacean, the juicy meat and complex mushroom flavours soon demanded my full attention. The wine, a Heimbourg 2010 Reisling, smelled like sea vegetables, tasted like meadow flora and pushed the sweetness of the dish to the extreme. Charlotte, ever the architect of cervine demise, chose venison, but was disappointed when it arrived rather more medium than rare. The poiverade sauce was a hit though, along with the tender celeriac. 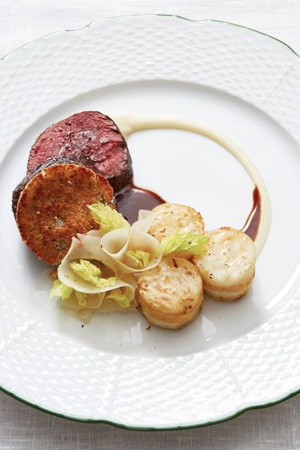 The wine choice was also very good, a Barbera d’Asti 2009, La Court, Michele Chiarlo, which had a wonderful depth and complexity with black pepper notes that intensified the flavours of the venison. The woodland trail led, as all trails ought, to something sweet. Charlotte’s dessert was an combination of fragrant and pleasantly unusual Douglas fir sorbet and pear parfait with a decorative sugar curl that added crunch. The accompanying 2013 Moscato di Asti Nivole (one of the oldest domestic grape varieties) was lightly fruity and suitable delicate. My dessert was titled ‘hazelnut’ and, in the absence of anything extravagantly chocolately, still managed to hit all the right buttons. In a crisp sphere was hidden a fluffy hazelnut mousse and the bed of praline soil was rich enough to convince me that no further chocolate was required. It was paired with a 1982 Graham’s Colheita tawny port which provided a rush of the warm, cosy sensation that this autumnal feast had been creating all evening. 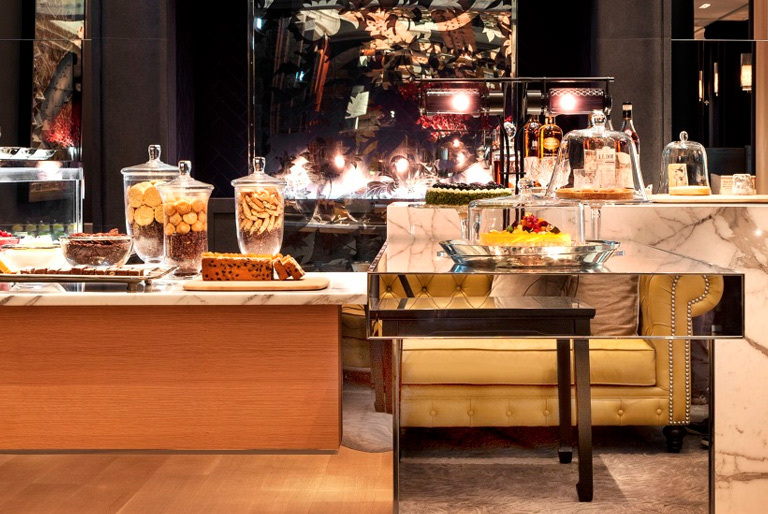 Following the culinary path of Amandine Chaignot, we arrived at our happy ever after. We were under quite a different spell than in the story of Snow White; we did not sleep, but we certainly did dream. The experience at The Mirror Room enchanted every sense and allowed us to wander through the bountiful British woodland without ever leaving our seats. Chaignot’s menu tells a delicious story and, as with all the classics, this is a tale that everyone should hear.